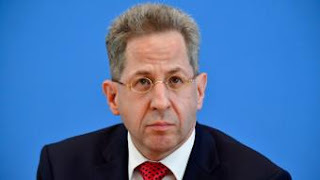 Germany's domestic intelligence chief, Hans-Georg Maassen, has been told to quit and move to a senior post at the interior ministry. The government decision came amid a row over Mr Maassen's response to far-right unrest in Chemnitz, eastern Germany. Anti-migrant "hunts" were reported there on 26 August after a German man was killed in a brawl with migrants. Mr Maassen doubted that foreign-looking people had been hounded. Chancellor Angela Merkel was urged to sack him. Critics said his scepticism downplayed the seriousness of far-right violence and intimidation in Chemnitz. Mr Maassen will leave the BfV spy service and become a state secretary in the interior ministry. German media report that he will actually move to a higher pay grade. It is not yet clear who will replace him.